AVALON PARK — Five people have been charged with mob action after prosecutors say a near riot erupted during a candlelight vigil in Avalon Park organized to honor a teen killed by police Sunday. A crowd gathered around 7 p.m. Tuesday in the 7900 block of South Avalon Avenue in memory of Desean Pittman, a 17-year-old boy fatally shot by police in Chatham. The Cook County Medical Examiner's Office reported his age as 20 at the time of the shooting, but Desean's family said he was 17. The group gathered for the vigil allegedly turned against police when a woman pointed at an officer monitoring the group and yelled, "That's the rookie mother------ that killed him," prosecutors said Wednesday. 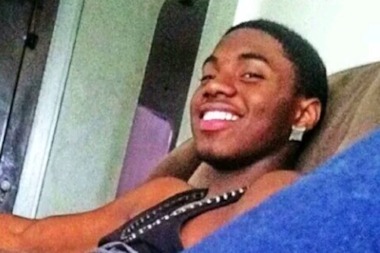 Desean Pittman, 17, was killed by police Sunday night in Chatham. Police said Pittman pointed a gun at an officer. The crowd began to chant, "Kill the rookie," as some pelted police with candles and bricks, authorities said. People threw branches, bottles and other debris from the street while yelling "CPDK," which stands for "Chicago Police Department Killer," officials said. At some point, a woman drove a Ford Escape into an officer, sending him to the hospital with a fractured leg. Two other officers also were hospitalized after they crashed their squad car heading to the melee, authorities said. Police arrested eight people. While some were released without charges, five were charged with felony counts of aggravated assault of a police officer and mob action, according to court records. Desean's mother, 34-year-old Natasha Haul, was among those who appeared on the charges in Cook County Central Bond Court Wednesday. After the judge ordered Haul, of Rochester, Minnesota, held on $75,000 bail, a woman in the front row of the gallery stood up. "They didn't even mention [during the hearing] that that's her son that was killed," said Haul's mother, 55-year-old Sharon White. White later said police intentionally provoked family members who were devastated by Desean's death. "The police officer kicked over a candle and said 'Awww, too bad he's dead,'" White claimed outside of the courtroom Wednesday. "Why would he do that?" Other family members said the officer laughed, tore down memorial posters and stomped on more candles. A police officer declined to immediately respond Wednesday when asked whether the officer who shot Desean was present at the vigil or is now on active duty. White said the altercations started when Desean's sister, who was overcome with grief, "lost it and hit the officer." When the officer started "man-handling" Haul's daughter, Haul got involved, and the situation escalated quickly, White said. Haul had just traveled from Minnesota to go the morgue, White said. After seeing her dead son's body riddled with bullets, she was not in her right mind, White said. 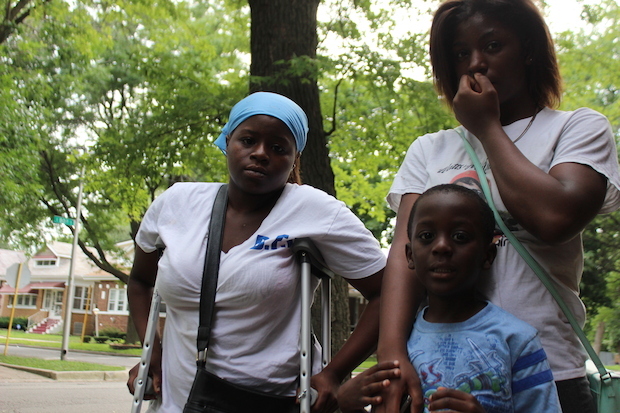 "Now, my daughter is not going to be able to bury her son because she's in jail," said White. Haul faces charges of aggravated battery to police and mob action. Rozette Long, Desean's aunt, also was arrested after the vigil but was later released. Long, 24, walked with crutches Wednesday and said she injured her knee in the altercation. "If the police weren't there, we would have had a nice memorial, because everybody there was family and friends," she said. "We're going through something right now, and they have to understand that. There was no need for them to be out there." Long said family got permission from neighbors to hold the vigil. She said the site of the vigil was the home where one of Desean's friends, Anthony Dickerson, was killed in August 2013. Terry White, Desean's grandfather, was also at the vigil when the fight broke out between mourners and police. "As the crowd grew, the police presence grew, and once that officer went over there and snatched those posters down and started stomping out those candles, that was it," Terry White, 58, said. "It was just ignorant. It was ignorant to move in like that," Terry White said. Four other people also face felony charges: Davontae Ruth, 18, of the 7800 block of South Kenwood; Lakendra Lottie, 19, of the 9300 block of South Clyde; Stephanie Primer, 21, of the 8100 block of South Ellis; and Derrick Wince, 26, of the 7400 block of South Chappel, according to court records. Police said the arrests were made Tuesday after objects were thrown at officers. Several officers were struck by the objects and treated for minor injuries, said Officer Ana Pacheco, a Chicago Police Department spokeswoman.